Going to design your new kitchen or renovate the old one then you must try the concept of modular kitchen because modular kitchen not add only beauty to your home decor but it also increase the functionality of kitchen and doubles the pleasure of cooking. Modular kitchens is the best way to utilize every inch of the available kitchen space by making it more functional and user-friendly where you get well designed place to keep your each and every kitchen utility such as kitchen appliances, utensils , groceries in a beautiful manner. Modular Kitchen designing options always based on your kitchen size, budget, requirements and family members for whom you are cooking and serving food. No matter how much kitchen space you have, you can always get a customized modular kitchen for yourself. 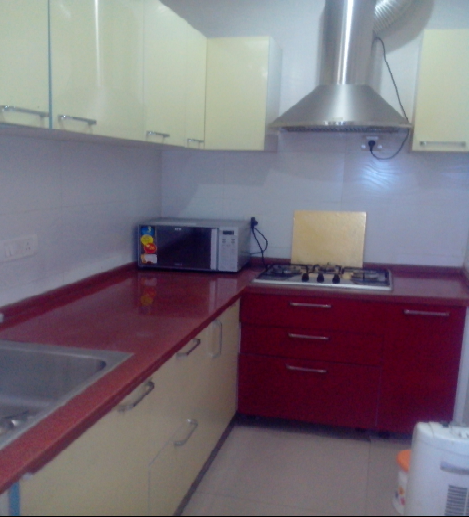 There are many companies which offer their services to get your dream kitchen within your budget. There are many Modular kitchen styles from which you can choose, but if you have small kitchen space then straight kitchen will be the best option for you. Straight Modular Kitchens are also known as one-wall or single wall kitchen in which all the work centres are align in a same row. Straight Kitchens are ideal for small space kitchen, it not only add style in your cooking space but make it more comfortable and organized. Usually in Straight Kitchens appliances and kitchen requirements are placed under the countertop and storage cabinets are placed overhead to get more clear space for cooking activities. 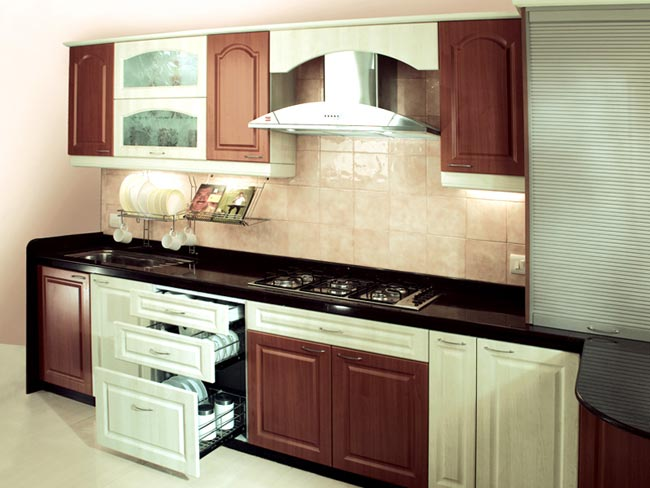 L shape modular kitchens are also good a option for small kitchens as it provide more workspace and storage area. The left out corners of the kitchen can be used as the dining area. 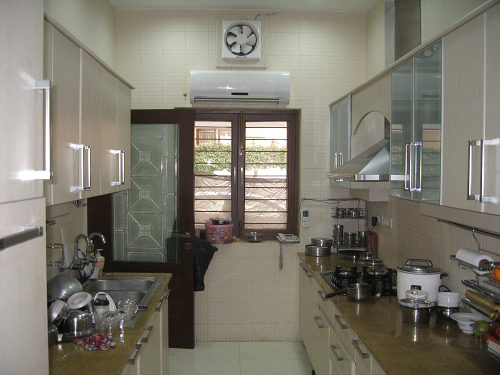 Gallery kitchen is also a good option to utilize small space in which all working areas next to each other. In this style of kitchen storage space is provide below the worktop and the cupboards are placed on the opposite wall to maximize the work area. While choosing the Modular kitchen designs for small kitchens work on some other things like Look at space-efficient storage solutions, compact kitchen appliances, keep the workspace clutter free to make the space more users friendly and inviting. It is good to choose light colored cabinets with gloss finish doors and deeper counters to accommodate more appliances and increase work space. You can hang the utensils on walls of the kitchen or use insides of cabinet doors to hang utensils, oven mitts and other miscellaneous items. To get customized modular kitchen according to size and budget hire professional kitchen designers as soon as your walls and floor are furnished who help you to get exactly what you want.